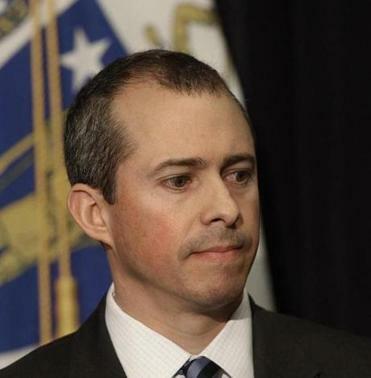 Jay Gonzalez was seen at a press conference in 2013. Former state budget chief Jay Gonzalez has taken steps toward a challenge to Republican Governor Charlie Baker, leaving his private-sector job and telling associates he is likely to run in 2018. Gonzalez, who resigned as chief executive of CeltiCare Health last month, is “seriously exploring” a gubernatorial bid, a source familiar with his plans said. But Gonzalez has been more bullish in private conversations, according to three people who have discussed the prospect. “I get the sense from all the conversations I’ve had with him that he’s in,” one said. That person would “bet heavily” that Gonzalez forges ahead. Gonzalez, a Needham Democrat, is working with the campaign manager for former governor Deval Patrick’s 2010 reelection bid, Sydney Asbury. Patrick’s campaign manager in his 2006 race, John Walsh, is advising Newton Mayor Setti Warren, who is also eyeing a run for governor. Gonzalez, 45, was Patrick’s second administration and finance secretary, a post that Baker also held during the 1990s. Like Baker, he left state government to join a health care organization. Baker political adviser Jim Conroy declined to comment. Gonzalez joined the Patrick administration in 2007 from a partnership position at the Edwards Angell Palmer & Dodge law firm. First, he was assistant secretary for capital finance and intergovernmental affairs. In 2009, he succeeded Leslie Kirwan as Patrick’s top budget aide, presiding over the state’s spending blueprint at a time when the cost of safety-net programs outpaced revenue. He left the administration in January 2013, later announcing he was joining CeltiCare, where he became chief executive in January 2014. Another recently departed senator has entertained thoughts of seeking the Democratic gubernatorial nomination: Dan Wolf, a Harwich Democrat who also did not seek another term. In a short telephone interview Wednesday, Wolf told the Globe he has not ruled out a 2018 bid. Wolf, the founder and chief executive of Cape Air, made a brief run for governor in 2013. The moves offer the earliest look at the field that could be shaping up to take on Baker, whom polls have found to be among the nation’s most popular governors. Baker, who has not formally announced a reelection bid, would begin a 2018 run with a massive fund-raising advantage. But some Democratic insiders see political weakness, too — and not just because he is a Republican in a state that overwhelmingly votes for Democrats. Baker campaigned hard on two ballot questions, in favor of expanding charter schools and against marijuana legalization. Voters went the other way by solid margins on both initiatives. And Baker has walked a careful line on Donald Trump, becoming one of the first Republican statewide elected officials in the country to say he wouldn’t be voting for the billionaire businessman — but also taking a more conciliatory tone since Trump’s victory over Hillary Clinton. That, Democrats say, could be a weakness. Jim O’Sullivan can be reached at jim.osullivan@globe.com. Joshua Miller can be reached at joshua.miller@globe.com.